eTeknix has teamed up with Aerocool to gift one of their fans with a brand new PC chassis! 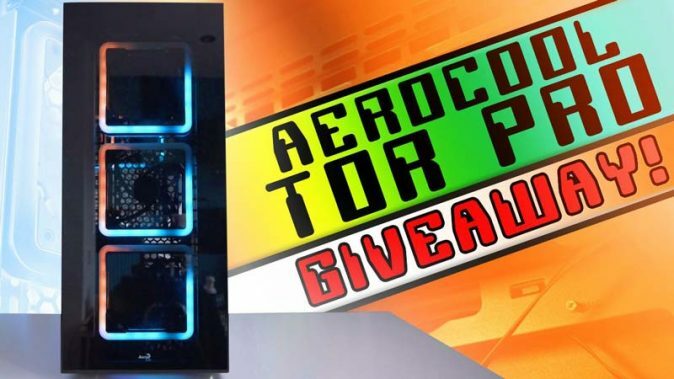 To enter in their latest Aerocool Tor Pro Chassis Giveawaygrab your free entries by following few simple steps listed down below! Features a 10-port hub with PWM control functions and allows you to connect up to 10 Addressable RGB fans or any other third-party LED accessories. Comes equipped with three 14cm Edge Addressable RGB fans in the front and one 14cm Edge Addressable RGB fan in the rear of the case. Featuring a stylish Edge design, these fans add a whole new element of flair to your rig. Comes equipped with beautifully crafted, full tempered glass side and front panels to properly showcase the inside of your rig. Supports air cooling in the front, top, and rear of the case and the side of the PSU cage to enhance cooling performance. Supports liquid cooling in the front, rear, and bottom of the case and the side of the PSU cage for maximum efficiency cooling. Winner must respond within 7 days of being drawn, or may automatically forfeit the prize to the next drawn winner.